Starbucks is a huge corporation. We can buy its coffee all over the world. And there must be a secret of its popularity and success. As we know, the company was originated in Seattle, Washington in 1971 as a purveyor of dark roasted coffee beans and coffee merchandise (Seaford, 2012). Since that time a lot has changed but ones still unchangeable – Starbucks and its success. As for me, we can define it by the next way: success = branding strategy + positioning of Starbucks. The marketing success of Starbucks is legion. The Starbucks revolution transformed gourmet coffee from a yuppie status symbol into a mainstream consumer good (Thompson, 2004). So, Starbucks became a nonpareil brand in coffeehouses for a generation (Kaplan, 2014). As far as we see, Starbucks popularity is closely connected with its brand. Let’s consider the branding strategy of Starbucks in more details. The corporation clearly defined 4 core brand strategy questions, answering which it created so popular and powerful brand. Intention: What do we exist to do? Benefit: Why does it matter? Values: What will our brand stand for over time and what is our operating principles? Personality: What face do we want to show to the world? What personality, tone, and manner do we want to communicate? The corporation conducted a lot of researchers to answer these questions which helped to build their brand strategy. Thereby, answers to the key questions created the branding strategy of Starbucks. The emphasis is made on that that coffee is not just a commodity. Instead of selling coffee as a commodity, for example, for $ 1.50 Starbucks sells it for three times more by creating an entire experience around the cup of coffee. With Starbucks it’s not just about of coffee. It’s about a moment of relax. It’s about the aroma, the myriad choices, the flavours and styles. It’s just a brief time-out while sitting in a comfortable chair and sipping a flavoured coffee before coming back into the outside world. So, the first element of the branding strategy concept is responsible for the satisfaction of the consumer by the all possible ways. A cup of coffee in the morning is a way of life for millions of people. Starbucks just used this natural habit of people and made on its basis a powerful brand. All great things are simple! 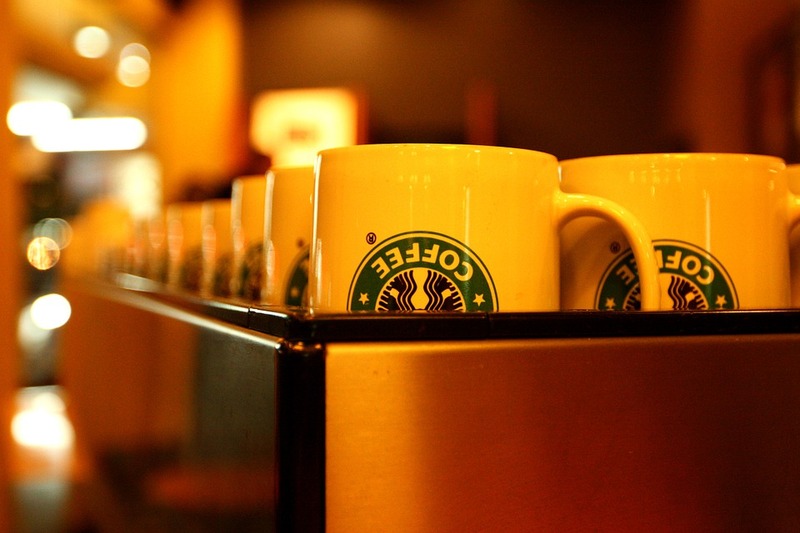 Starbucks just offer its consumers a perfect cup of coffee and makes money. The second element of the concept – benefit is tightly connected with the augmented product which means the inclusion of additional features, benefits, attributes or related services that serve to differentiate the product from its competitors. For Starbucks, it provides a number of customer-oriented services to increase the value and attractiveness of the core products offered to the customers. One additional service is the WiFi access which is provided in the many of the Starbucks shops as a courtesy to the customers and use the WiFi connection as a way to attract the customers especially those young customers who could not be disconnected from their social world. The third element – values are closely connected with a high sense of awareness of Starbucks to environmental conditions, invites young people to care about the things that can keep the environment healthy. So, Starbucks stands for the keeping of environment. As for the personality, I think, Starbucks is a very attractive one. Nice atmosphere and flavour coffee, as for me, wonderfully describe the personality. This personality is widely popularised by the means of media so as Starbucks has a big brand presence online. Starbucks is a brand which is known and loved all over the world. It owes its popularity to the successful and innovative branding strategy which keeps up with the times. Kaplan, D. (2014). Starbucks: The Art of Endless Transformation. Inc. Magazine, June. Seaford, Bryan C.; Culp, Robert C.; Brooks, Bradley W. (2012), April 1). Starbucks: Maintaining a Clear Position. Journal of the International Academy for Case Studies, Vol. 18, No. 3. Thompson, J. (2004). Starbucks Brandscape and Consumers’ (Anticorporate) Experiences of Glocalization. Journal of Consumer Research, Vol. 31, No. 3. If you need a marketing essay, you will probably need to spend a lot of time on it. The task may appear to be harder than it seems the first time. Academic papers require a lot of research, reading and observation, and you have to deal with a lot of other people’s opinions on the matter, which you may not like or agree with. If you find it hard to read criticism about your favorite coffee provider, we can always help by writing a great marketing essay for you. Just place your order to receive the paper you need. We are available 24/7! Why wait any longer? Do this now!